This Miso soup is prepared with white miso, a pungent paste made from soya beans and yellow in colour. (There are also a saltier version, which is reddish-brown.) Traditionally, miso soups use dashi, a stock made from kelp and dried fish flakes. Both miso and dashi are available in Asian markets. Reserve roughly 120 ml dashi and pour the rest into a pot. Bring to the boil, add radish. Cook for 3 minutes. Reduce heat, add tofu. Stir for 2-3 minutes. In a bowl, beat miso with reserved dashi until smooth, then stir into soup. Simmer for 2-3 minutes until soup is thoroughly combined, then stir in most of the spring onions. 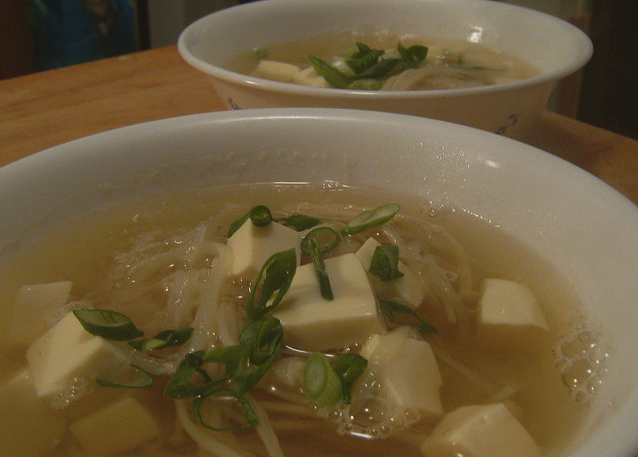 Ladle soup and daikon radish into bowls and garnish with remaining spring onions.